Two horizontal dials side by side, one for Central Standard Time and one for Mountain Standard Time. The CST dial shows hour lines for 7 AM to 7 PM, the MST dial shows 6 AM through 6 PM. Corrected for longitude. Each dial is approximately 13 meters in diameter. In front of the dials is a large concrete plaque with the equation of time and analemma. The analemma is represented as summer on top and late months (Feb, Jul) on right. This is not the way it would be viewed in the traditional series of photos nor is it the way a shadow would be traced. The width is exaggerated, presumably to allow a better reading of the minutes of time. The paint is peeling badly. A small horizontal dial, about 18 inches in diameter. The dial plate is tilted 2 deg to the horizon to allow water run-off. However, more unusual is the base that contains a hand crank connected to a scalloped drum that tilts the entire dial to adjust for the Equation of Time. The drum is rotated to the current date and the drum edge pushes a cam that tilts the plane of the horizontal face so that standard time is indicated to within half a minute. The dial is actually mounted on an equatorial axis. Since 1979 the dial has gone into a state of disrepair and is overgrown by bushes. In July 2011 it is reported that the adjusting knob no longer works to tilt the dial. This plain dial formed on a concrete base has an elegant gnomon, designed with an interior curve and oval. But alas, don't go to Florida to find it. Sometime in 2013 as Harcourt closed its Florida office, the new tenet had no use for the sundial and had it scheduled for demolition. Beautiful vertical dial, approx 12x6 foot of Georgia marble with a brass gnomon approx 5 foot long. Declination lines present. Hour & half hour lines with hours in Roman numerals. Sunburst pattern above gnomon. 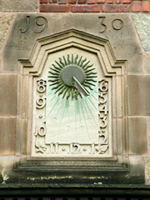 From the Guidebook, published by the Garden: 'The famous sundial carved on the south wall of the Tower indicates the latitude and longitude of Iron Mountain. It is known as an erect declining dial as it stands vertically at an exact right angle with the surface of the earth... and does not face directly south but is tilted towards the east with a declination of 4 degrees, 20 minutes.' It has an Equation of time chart and shows the days of the months as well. Directions are to 'Add minutes shown for each day to obtain Eastern Standard Time.' The tower and adjacent sanctuary were dedicated by Calvin Coolidge, President of the United States, February 1, 1929. Modern design for a vertical dial declining 20.5? east on a brick wall. The gnomon is a twisted sheet of bronze, casting shadows onto granite hour marks. The dial was designed by Marti Cowan using Waugh's formulae for vertical dials. Frederick Orthlieb, professor and chair of the Dept of Engineering at Swarthmore "had a part in locating the bent-plate gnomon so as to give correct indications on the vertical wall? As installed, the gnomon's indicating edge (which lies on a Polar Axis) casts a quite short shadow in Autumn and Winter and requires some observing skill to make a close estimate of indicated time, but in Spring and Summer the longer shadow moves over the granite hour marks very plainly." A cathedral landmark. 6 foot rectangular crypt with a 2 foot circular horizontal dial in bronze. Adjoining the dial is a cross noon marker that casts its shadow onto the crypt with major Christian holidays marked through the year. Gnomon has a folded shape of 2 cm width but the hour lines form only one dial center although the space at noon gap is 1 cm. Norman Bliss, who reported this dial, taught astronomy at Taft School for many years. He challenged students to find this abstract dial. The dial no longer exists and was destroyed when the building was demolished. Vertical dial on Sterling Library. Rectangular stone with hour lines and Arabic numbers. Gnomon is a plain rod emanating from a sunburst. Stonework shows it to be built into the wall of the library. This armillary dial with a sailing ship weather vane is on the cover photo of Albert Waugh's book "Sundials - Their Theory and Construction" (paperback edition). The dial sits atop a short stone platform outside of the Treworgy Planetarium, on the grounds of the Mystic Seaport Museum in Mystic, CT. To correct solar time to clock time, the dial has an Equation of Time table at the base. 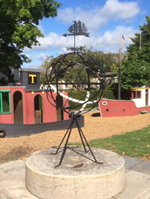 The armillary sphere underwent a restoration in the summer of 2015, removing corrosion, repainting the dial structure and equatorial band, and re-stencilling the longitude degree markings. A bronze equatorial dial presented to the college as a gift from the class of 1889. For its age, it is in remarkably good condition. The 3 foot wide by 2 foot tall half cylinder is engraved with both hour and declination lines. At the noon-equinox point of the dial face a perpendicular pole rises to the centerline of the cylinder and supports a N-S gnomon rod. Unfortunately the southern portion of the rod is missing. The base is a square, tapered pillar. This is an 18th century polyhedral dial (dodecahedron). The dial was originally located at The Abbey, Storrington, Sussex, England. Carved stone with ten dials on a dodecahedral, some sunken, some planar. Pillar is about 12 ft. high. Vertical dial on an eight ton granite cube, 4 foot on a side. Three vertical dials on east, south and west sides. Gnomons are missing Designed by R. Newton Mayall. A similar CIGNA cube dial is in Los Angeles, Union Square. Both dials owned by CIGNA Insurance Co.
A horizontal dial from Picture Rock Sandstone with 24k gold-plated inlaid brass fittings, 25 inches wide by 36 inches long, with gnomon 12.5 inches high. Gnomon is 1.5 inches thick. Total sundial weight 110 lbs. Time is marked in 10 minute intervals. Has Equation of Time and moonlight reading time correction table. Has the time and direction of sunrises and sunsets, the solstices, equinoxes, solar azimuth, and high noon.